AS A WRITER OF GREAT WISDOM SEEING WHAT IS NOW GOING DOWN IN PLAIN SIGHT, ONLY THE 2ND AMENDMENT STANDS BETWEEN A SUCCESSFUL LIBERALISM POWER GRAB OR THE USA REMAINING A FREE PEOPLE. This exploiting of the kids thing: I have tried to dismiss commenting on this issue several times. But, I just can’t hold beck my pen any longer, I must vent. This exploiting of the kids breaks almost every law and rule there is in terms of sheer raw human survival, and is iron proof of the almost total destruction of USA culture and family values. My god! No normal human or animal species ever existed that did hardly anything with the youth other than keep teaching them how to prepare themselves for survival, period. Experience and wisdom is everything in terms of long term human survival, what the hell does a kid really know in term of long term survival other than thinking they have the true answer to everything. Never would a herd of elephants go on any journey without the old matriarch with years of experience leading them. Teach and instill in the very young proper norms and traditions and when they get older they will not depart is an old biblical truth (paraphrased). 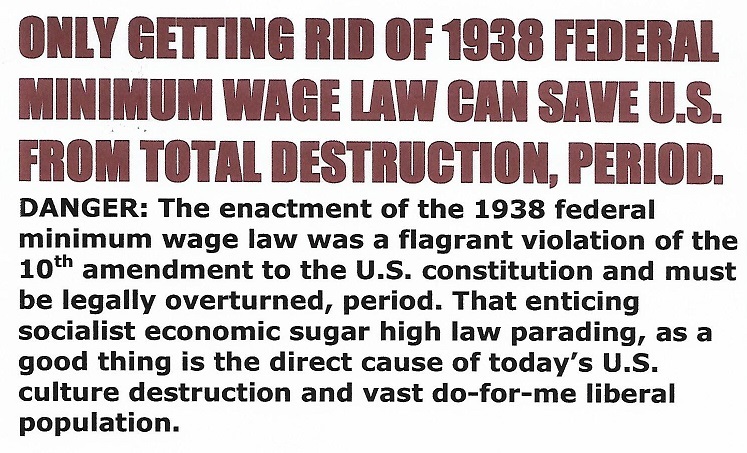 The 1938 socialist minimum wage law blocks off and kills the societal disciplining power (purging) in the USA free market place economy, thereby leaving nothing to stop extreme liberalism from over-powering common sense and sound judgment. Now, around 80 years later USA culture and family values has been ripped to threads. Yet, I drum beat and plead to no end to repeal this insane arch-evil 1938 socialist minimum wage law, but no one will listen or even hear me. Myself, I am a screwed up neurotic handicap that is driven by some unknown force to keep sounding the emergency stress call alarm for the survival of my beloved country. I fear and hate any kind of limelight and wish that I could just go off somewhere and be left alone, but I can’t forsake my duty and runaway. Practically all of my life I have fought an internal mental battle to stay sane and survive. So, with tears in my eyes, I will sign off and carry on. With love always. PS: I know that probably 95 percent of the USA population disagree with almost everything I write, that is not an easy burden to face or carry and to go against the grain like that. But, the world has advanced by individuals, not by the herd, the crowd, or the tide. Amen. FREDDIE LEE SIRMANS LOG: 25 MARCH 2018, 1458 HOURS.